The American Geophysical Union's Meeting of the Americas will take place in Cancún, Mexico, from 14th to 17th May 2013. There will be several sessions relevant to ionospheric and geospace science, which you can find through the links below. Note that this is only a selection, and you might want to check the meeting web site for more suitable sessions for your contribution. Abstract deadline is 6th February 2013, 23:59 ET. The Swedish company Gelab (www.gelab.se), located in Gäddede, is a contract manufacturer specialising, among others, in antenna. Gelab has been assisting the EISCAT_3D preparatory phase project in the preparation of possible antenna and antenna array designs. 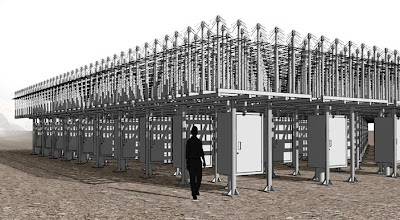 The picture shows one solution for the array, where the antennas are grouped on platforms elevated above the ground to avoid snow influence. The design reminds of that of the AMISR, which, too, is based on grouping antennas in panels, and also of that of KAIRA, which raises the aerials significantly above ground in order to have snow pass freely down to the ground. Here, every group stands on tall legs, making access from below easy. Also, every group features an easily accessible instrument cabinet for the first-level electronics. The design of the individual antenna elements is an inverted V.
This suggestion is one possible design for the future EISCAT_3D radar system. The current four-year EISCAT_3D Preparatory Phase Project will continue until September 2014 and thus has entered the critical phase of decision making with regard to many design questions. Image courtesy of Gelab, text Jonny Johansson and Thomas Ulich. Please note the upcoming abstract deadline for the 2013 Beacon Satellite Symposium will be held at the Assembly Rooms in Bath, UK on 8th to 12th July 2013. Cathryn Mitchell of the University of Bath had graciously offered to be the local host this symposium. This meeting will provide a unique opportunity for ionospheric scientists from all over the world to meet and collaborate on the ionospheric effects on radio propagation. This meeting is primarily sponsored by the Beacon Satellite Group of the International Union of Radio Science (URSI) Commission G. The Beacon Satellite Group is interdisciplinary, servicing science, research, application and engineering interests. These interests include all aspects of satellite signals observed on the ground and by receivers on-board satellites. The Beacon Satellite Studies Group was originally formed in 1972, with the first Symposium at Graz, Austria. Symposia have continued to meet at two to four year intervals with meetings held at various worldwide locations. From the beginning, the two main areas of interest in Beacon Satellite Studies have been Ionospheric Electron Content and Scintillation. With more recent developments in ionospheric tomography, assimilation models, occultation techniques, distributed ground and space based arrays of ionospheric measurements, international IHY and IPY activities, space weather and satellite based navigation and communication systems; these studies have gained new momentum and perspectives. Details on the abstract submittal process together with all the other organizational details are available on the Beacon Satellite web site at: www.beaconsatellite2013.net. Abstract deadline is 31st January 2013. Based on a text by Patricia Doherty, Cathryn Mitchell and P.V.S. Rama Rao. University of Leicester planetary scientists have found new evidence suggesting aurorae - similar to Earth’s Aurora Borealis - occur on bodies outside our solar system. Aurorae occur on several planets within our solar system, and the brightest - on Jupiter – are 100 times brighter than those on Earth. However, no aurorae have yet been observed beyond Neptune. A new study led by University of Leicester lecturer Dr Jonathan Nichols has shown that processes strikingly similar to those which power Jupiter’s aurorae could be responsible for radio emissions detected from a number of objects outside our solar system. In addition, the radio emissions are powerful enough to be detectable across interstellar distances – meaning that aurorae could provide an effective way of observing new objects outside our solar system. Aurorae occur when charged particles in an object’s magnetosphere collide with atoms in its upper atmosphere, causing them to glow. However, before hitting the atmosphere, these particles also emit radio waves into space. The study, Origin of Electron Cyclotron Maser Induced Radio Emissions at Ultracool Dwarfs: Magnetosphere-Ionosphere Coupling Currents, which recently appeared in the Astrophysical Journal, shows that this phenomenon is not limited to our solar system. It shows that the radio emissions from a number of ultracool dwarfs may be caused in a very similar, but significantly more powerful, way to Jupiter’s aurorae. Dr Nichols, a Lecturer and Research Fellow in the University of Leicester’s Department of Physics and Astronomy, said: “We have recently shown that beefed-up versions of the auroral processes on Jupiter are able to account for the radio emissions observed from certain "ultracool dwarfs" - bodies which comprise the very lowest mass stars - and "brown dwarfs" - 'failed stars' which lie in between planets and stars in terms of mass. "These results strongly suggest that aurorae do occur on bodies outside our solar system, and the auroral radio emissions are powerful enough - one hundred thousand times brighter than Jupiter's - to be detectable across interstellar distances." The paper, which also involved researchers at the Center for Space Physics, Boston University, USA, could have major implications for the detection of planets and objects outside our solar system which could not be discovered with other methods. What’s more, the radio emission could provide us with key information about the length of the planet’s day, the strength of its magnetic field, how the planet interacts with its parent star and even whether it has any moons. Dr Nichols added: "I am part of a group who have recently been awarded time on the Low Frequency Array (LOFAR) - centred in the Netherlands but with stations across a number of countries in northern Europe including the UK - to try to observe aurorae on exoplanets, so hopefully there will be some interesting results soon." Dr Nichols’ work was funded by the Science and Technology Facilities Council. The LOFAR exoplanets work is led by Philippe Zarka, based at CNRS Observatory, Paris. Issued by University of Leicester Press Office on 21 January 2013. Development of the mesospheric Na layer at 69° N during the Geminids meteor shower 2010, by T. Dunker, U.-P. Hoppe, G. Stober, and M. Rapp, ANGEO, 2013, Vol.31, pp. 61-73, SRef-ID: 1432-0576/angeo/2013-31-61, http://direct.sref.org/1432-0576/angeo/2013-31-61. Numerical modeling study of the momentum deposition of small amplitude gravity waves in the thermosphere, by X. Liu, J. Xu, J. Yue, and S. L. Vadas, ANGEO, 2013, Vol.31, pp. 1-14, SRef-ID: 1432-0576/angeo/2013-31-1, http://direct.sref.org/1432-0576/angeo/2013-31-1. 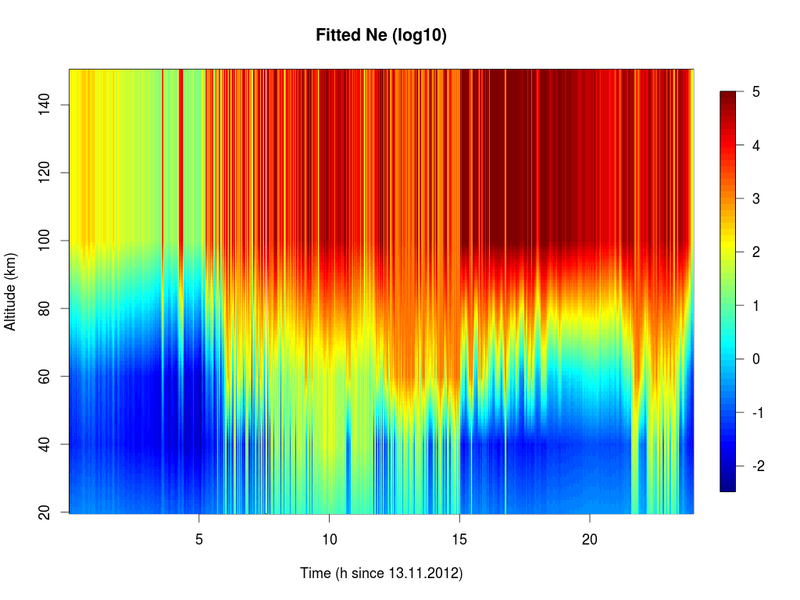 Medium-scale 4-D ionospheric tomography using a dense GPS network, by M. M. J. L. van de Kamp, ANGEO, 2013, Vol.31, pp. 75-89, SRef-ID: 1432-0576/angeo/2013-31-75, http://direct.sref.org/1432-0576/angeo/2013-31-75. This video was published on Euronews just this evening. It is about the European Solar Telescope (EST) project, which aims to install a 4-m solar telescope with adaptive optics on the Canary Islands. The objective is to unravel the secrets of solar activity – and thereby the sources of all the space weather phenomena, the consequences of which we will be monitoring with EISCAT_3D. On the EST web site, there's a list of top-level science goals. Goal VI. "The Explosive Sun" with its subtopic of "Solar flares and space weather" is the one most closely related to EISCAT. EST is currently in the Design Study phase funded by the 7th Framework Programme. It is a pan-European project "involving 29 partners, plus 9 collaborating institutions, from 15 different countries" as it says on their web site. We just happened to come across an absolutely stunning short film of the Northern Lights, photographed in "northern parts of Norway, Finland and Sweden during autumn 2011, winter and spring 2012." 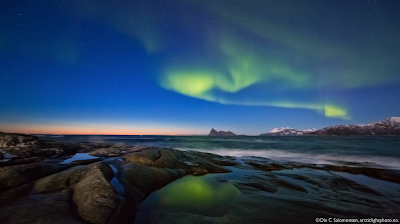 The video is by accomplished photographer Ole C Salomonsen from Tromsø. Enjoy the film, and also the weekend! Planned is this time a focus on data analysis and management, while on Tuesday and Wednesday pre-noon (7-8 May) all science topics to be studied by EISCAT_3D are covered. The meeting programme's outline is still open to discussion until 29th March, please communicate any comments and suggestions to anyone of the programme committee, Ingrid Mann (ingrid.mann -at- eiscat.se), Craig Heinselman (craig -at- eiscat.se), Anita Aikio (anita.aikio -at- oulu.fi), Ian McCrea (ian.mccrea -at- stfc.ac.uk), and Esa Turunen (esa.turunen -at- oulu.fi). You can register for the meeting by email to scb -at- irfu.se, the deadline is 8th April 2013. Photo: Thomas Ulich, during the EISCAT_3D User Meeting 2012. Electron Density Profiles from Riometer Data? While it's not Science Tuesday today, there's such exciting news on the KAIRA blog, that we can't wait relaying to all of you. The Kilpisjärvi Atmospheric Imaging Receiver Array (KAIRA), which is a LOFAR receiver originally designed for radio astronomy, and which was deployed for EISCAT_3D prototyping work, has now beed used successfully for cosmic radio noise absorption measurements, and the team at Sodankylä Geophysical Observatory (SGO) were able to invert the data to electron density profiles of the ionospheric D region! Read more about this cutting-edge development on their blog pages! The measurement technique behind this develop has been used for a long time by instruments called "riometers", which stands for Relative Ionospheric Opacity Meter for ExtraTerrestrial Electromagnetic Radiation. This instrument records the power of the cosmic radio noise, and by comparison to the power received during a so-called "quiet day", i.e. when no ionospheric disturbances were seen, one can deduce the opacity of the ionospheric D region, i.e. how transparant the atmosphere between typically 50 and 100 km altitude is for radio waves of a certain frequency. The opacity is a function of electron density and electron-neutral collision frequency, which, in turn, is a function of neutral air temperature. Today, 2nd January 2013, is the first day in the office for the new Director of EISCAT, Dr Craig Heinselman. Craig will hold the post for initially three years, and he will be based at the EISCAT Headquarters in Kiruna, Sweden. Welcome, Craig, and all the best for your job and the challenges ahead! The photo shows Craig during the excursion of last year's Incoherent Scatter Radar School, which was held in the beautiful town of Banff, at the edge of the Canadian Rocky Mountains. 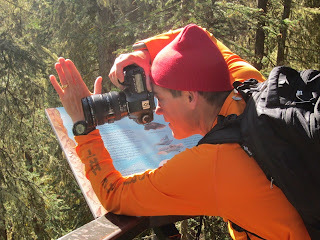 As you can guess, Craig is a keen photographer and an accomplished long-distance runner. The year ahead will bring a lot of important decisions for EISCAT_3D: many things have to click into their places in 2013, and we hope for the first funding to be granted. It will be exciting, stay tuned!